It actually looks like Rag’s room in Molten Core in some ways, doesn’t it? So, preorders for the upcoming Hearthstone adventure, Blackrock Mountain, are apparently starting today. 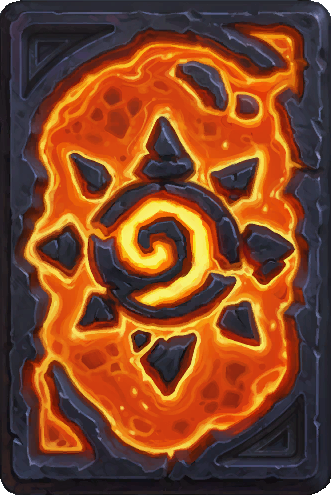 Reserving all five wings nets you the lovely “Molten Core” card back as a bonus, so hurray! Still, that’s not really much of a reason to spend $25 on all five wings(though at $7/wing individually, for the love of god please just buy the bundle). It’s the sweet new cards we want to pay for! 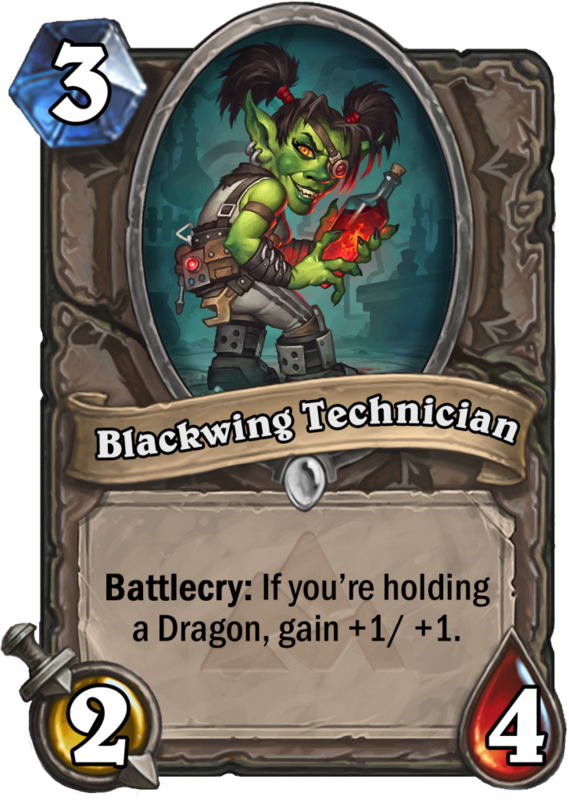 I’m sure Blizzard has some awesome stuff in this adventure for us Ladder Folk, but for now they’ve played with their hand close to the vest with some role-players from the obvious dragon-themed deck that this adventure may spawn. Some people, myself included, are not terribly excited about paying $25 for 31 new cards that probably won’t change the landscape of ladder very quickly or very much, though I’m sure it could happen did happen before with the advent of Undertaker, so who knows. I got to thinking about how to be excited about these cards without speculating too much on potentially what else might be in the adventure. Thinking became musing, musing became planning, and now I am all interested and stuff, and I’ve got a few interesting ideas to share that might get you excited about the spoiled cards too! I’m not reviewing every card spoiled, mostly because Rend Blackhand is pretty weaksauce, and even barring his poor stats, his ability to do anything beyond being a mediocre creature is firmly grounded in how many awesome dragons out of 31 cards we get from Blackrock Mountain! Dragon Egg doesn’t look like much, mostly because it isn’t. 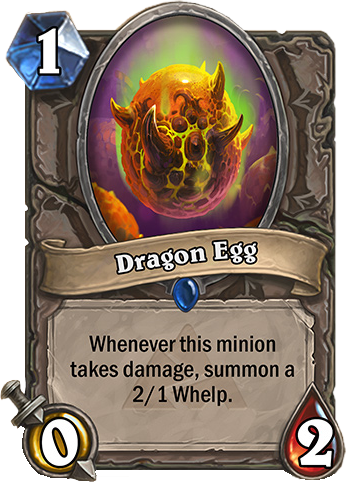 It’s a value card, and appears much less exciting that Nerubian Egg because a 4/4 is far more problematic for more decks to deal with than two 2/1 whelps, and that’s assuming you get maximum value out of this by spending resources hitting it twice. The big difference is the cost of Dragon Egg – at one mana, it rarely takes the place of a different drop, and is far easier to fit into turns where you just want to spend all your mana. Two mana is when the game really starts, and spending it playing a card that might later turn into a 4/4 is risky, especially against aggressive decks. Another interesting aspect of Dragon Egg is that any damage triggers it. I’m not saying this is good, but a Mage could play this on one, and ping it on two to create value. I know a 2/1 on two isn’t as amazeballs as something like Mechwarper, but in a deck that utilizes Dragon Egg with buffs like Abusive Sergeant already, it can turn a hand with no two-drop into something serviceable. Really though, the best card I thought of to pair with Dragon Egg is undoubtedly Cruel Taskmaster. The battlecry gives you a whelp, and when the Egg dies, you get another. You got your two whelps from one card and, more importantly, only two more mana. You don’t even have to trade-off the Egg the turn you play Taskmaster since the buff is permanent! As you’ll soon see, there are several cards that appear to play well with Cruel Taskmaster and other cards that can damage your own creatures, and many people have been hoping for a new style of Warrior deck to emerge for some times. I don’t think any of the cards spoiled so far are good enough to do it on their own, but they could be solid role-players. Well, there I go, evaluating cards based on cards that may or may not exist. It’s really hard to avoid the hype! Not many people are talking about this card. It isn’t very impressive on the surface, and of course its value is partially reliant on unspoiled cards. Let’s make a very small assumption, but base it in what we know. We know people DO play dragon cards. Azure Drake and the legendary dragons see a fair amount of play, and we know that Hungry Dragon(a card I’m not talking about today because well, it’s a 5/6 for four mana, do we really need to analyze why that’s good?) exists, so that makes, maybe, six or seven dragons one could just randomly play in a slower deck. Why would we want to play this card anyway? I’ll let you in on a little secret – 3/5s are really, really good right now, and 3/5s for three mana are as good as it gets. Being able to survive the front end of a Piloted Shredder forces an opponent to either spend mana to kill it that could have been another dude, or your Technician gets to kill another dude. I don’t think that Dragonkin Sorcerer is good enough to talk about, but it also has that sort of value if you’re into buffing minions. Yes, the various Yetis have that value too, but Chillwind is boring, and the Mechanical can be a liability. Giving an aggressive deck more cards to play, even if they are spare parts, is dangerous! I’m actually not impressed by Lava Shock, but I really hope I’m wrong because I love Shaman more than most classes. Yeah, maybe there’s a home for it, and yes, it does make your turn five less annoying because you never have to choose between playing Spirit Wolves or Lightning Storm and your Fire Elemental on the next turn, but it’s just not a good card because it doesn’t really kill anything. Maybe a burn spell that doesn’t overload by itself is something Shaman need. What it does have is tempo by undoing the harm that your overpowered overload spells do to you, which is a powerful thing. 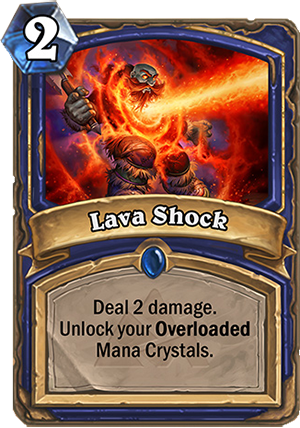 Lava Shock can also go to the face, and joins a HUGE array of cheap burn spells. When GvG was released, the very first deck I built was an aggressive Shaman deck with Zap-o-Matic, Dunemaul Shaman, and every burn spell Shaman had access to. The deck was pretty bad, but mostly because there wasn’t a critical mass of burn, and the overload on many of my spells was too much to overcome when using them to control a board. I don’t think it will be, but I hope that Lava Shock is the role-player that a different sort of aggressive deck needs to be a real thing. I’ve saved the best for last. Yes, many people are interested in brewing with Grim Patron, sometimes trying to build decks with Grimmy as the cornerstone. But that’s not really why he’s good. You could just pick a card or two from a Warrior list, jam two Patrons in, and call it a day! There are already several existing synergies to take advantage of Grim Patron’s ability. Whirlwind, Cruel Taskmaster, Death’s Bite, and Baron Geddon are all cards commonly played in Warrior lists that work well with the Patron. 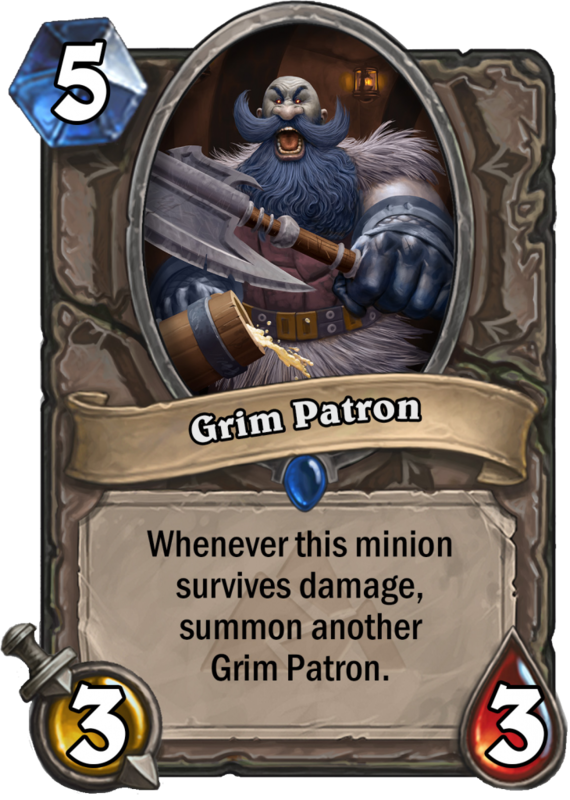 Grim Patron doesn’t look like much though, even if you make a second one, and I agree. It is not an intrinsically powerful card. However, it has the ability to actually pressure an opponent far earlier than most Warrior lists can, and provides a completely different angle of attack by threatening to flood the board with smaller dudes. Being on curve with Death’s Bite is just a bonus. Imagine clearing your opponent’s board on turn five and ending up with two of these guys in play. There’s also the option of going all-in by playing Bouncing Blade. If you assemble the dream scenario where Grim Patron is the only creature in play when you play Bouncing Blade, you have a roughly 17% chance you only end up with two dudes. But you also have an almost 38% chance to end up with six! I admit, I didn’t do this math myself, so credit to this Reddit post on Bouncing Blade math, and also their fault if they did the math wrong! That’s all from me today. Be sure to follow this blog for updates on all 31 new cards coming from Blackrock Mountain, and also keep an eye on the BlizzPro spoiler page for new cards, then come here and comment with your favorite new cards and why!